There are several types of antidepressant medication, but they all generally work by affecting neurotransmitters like serotonin and dopamine, which communicate between neurons in the brain. What Are the Long-Term Effects of Citalopram? What Is Fluoxetine (Prozac, Sarafem)? What Is Paroxetine (Paxil, Pexeva, Brisdelle)? When an individual suffers from depression, these neurotransmitters may not bind to neuron receptors very well, or the brain may not produce enough of these chemicals. Consequently, pleasurable stimuli do not affect people suffering from depression because the neurotransmitters do not communicate as well. Antidepressants work on different neurotransmitters in different ways, and are not fully understood yet. 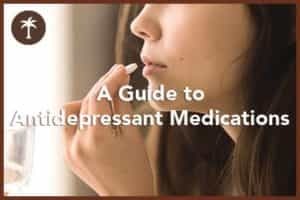 Consequently, people dealing with depression may be prescribed many types of antidepressants, or different doses of these medications, to find the right type and dose that works best. Selective serotonin reuptake inhibitors (SSRIs): This class of antidepressant medication is the most common because it tends to work, at least temporarily, for the widest variety of people. In an average person, when a neurotransmitter like serotonin is released by the brain, it communicates the signal that a pleasurable event has occurred to other neurons, and then is reabsorbed by the brain. SSRIs prevent the reabsorption from occurring, so serotonin stays in the synapses, or the space between neurons. This allows the neurons more time to process serotonin, giving an individual’s brain more time to process the serotonin. Common SSRIs include Zoloft, Prozac, Paxil, Lexapro, and Celexa. Serotonin and norepinephrine reuptake inhibitors (SNRIs): This class of antidepressants is newer compared to other medications. Like SSRIs, these drugs prevent the reuptake of neurotransmitters like serotonin, and in this medication’s case, also norepinephrine. Medications in this class include Pristiq, Fetzima, Khedezla, Effexor, and Cymbalta. Norepinephrine and dopamine reuptake inhibitors (NDRIs): These medications prevent the brain’s reuptake of dopamine and norepinephrine. Wellbutrin is the only medication in this class. Serotonin antagonist and reuptake inhibitors (SARIs): These medications function in the brain in two ways. They prevent the reuptake of serotonin, and also prevent serotonin from binding to certain neurons, redirecting the neurotransmitter to other neuron receptors. Medications in this class include nefazodone and trazodone. Tetracyclics: This class of medications does not stop the reuptake of neurotransmitters, but instead seems to stop neurotransmitters from binding to specific receptors so they can remain in the synapses for longer. Medications in this class include Remeron, Mazanor, Ludiomil, and Asendin. Tricyclics: These medications prevent reabsorption of serotonin and epinephrine by stopping these neurotransmitters from binding to specific receptors. That allows the neurotransmitters to stay in the synapses longer. However, tricyclics are typically not prescribed anymore unless the individual suffers very resistant or severe depression, because there are many potential serious side effects, like high blood pressure and heart arrhythmia. Drugs in this class include Elavil, Tofranil, and Pamelor. Monoamine oxidase inhibitors (MAOIs): In the brain, monoamine oxidase is an enzyme in the brain that breaks down neurotransmitters like dopamine, serotonin, and epinephrine, so they can be reabsorbed. By preventing the enzyme from taking effect on these neurotransmitters, they stay in the brain longer. However, like tricyclic antidepressants, these medications have severe side effects, including high blood pressure. They can also cause a buildup of serotonin in the brain leading to “serotonin syndrome,” which can be life-threatening. Medications in this class include Emsam, Marplan, Nardil, and Parnate. Can People Become Addicted to Antidepressant Medications? Antidepressant medications are not considered addictive in the same way that alcohol, opioid medications, heroin, amphetamines, or cocaine are addictive, but people who stop taking antidepressants often suffer withdrawal symptoms lasting between one week and two months. Like addictive drugs, antidepressants affect the levels and uptake of “happy” neurotransmitters in the brain like norepinephrine, dopamine, and serotonin, so withdrawal symptoms are similar to withdrawal symptoms from addictive drugs. Some medical research suggests that between 50 and 80 percent of individuals taking Paxil who stop taking the medication suffer withdrawal symptoms. Although antidepressant medications are not considered addictive, the prevalence of withdrawal symptoms in people prescribed these medications raises serious questions about whether or not they should be relabeled as potentially addictive. Additionally, medical research has shown that overuse of tricyclic antidepressants due to prescribing larger doses or taking these medications for too long can lead to overdose, typically nonfatal. However, antidepressant overdoses, usually with tricyclic antidepressants, is the second leading cause of overdose death in the US. Other antidepressant medications do not seem to have severe side effects. While antidepressants by themselves are not currently considered addictive by medical professionals, individuals who suffer other substance abuse or addiction problems are more likely to misuse antidepressant medication. Off-label use of antidepressant medication or taking extremely large doses of these medications can lead to a flood of neurotransmitters in the brain, which leads the individual to feel euphoric, or “high.” Abuse of antidepressants tends to be comorbid with other substance abuse issues. Individuals who are undergoing withdrawal from other drugs like opioids or amphetamines may be prescribed antidepressants in order to stabilize moods during the detox process. There is growing concern that, if these medications are prescribed in too high a dose or too soon after the person decides to stop taking other addictive substances, the individual will grow dependent on antidepressant medications. 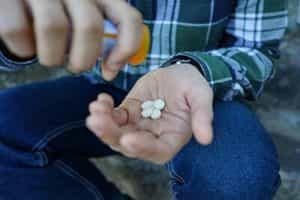 While this is still not called an addiction outright, dependence on any medication after suffering a drug or alcohol addiction can be harmful. People undergoing antidepressant withdrawal can seek help from medical professionals. If they have a prescription through a psychiatrist or other doctor, they should work with their doctor to wean off the medication. If they are not using antidepressants as prescribed, they should consider seeking help from substance abuse rehabilitation facilities.